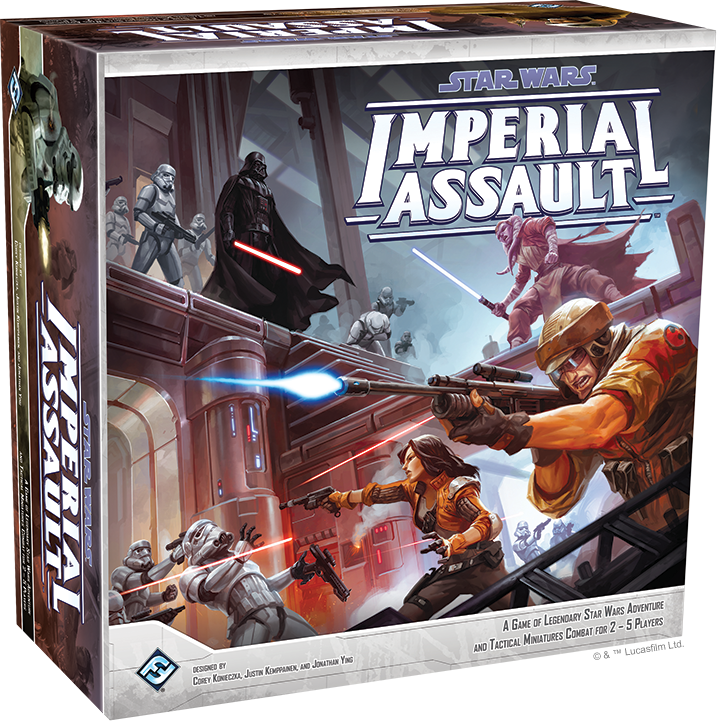 Imperial Assault puts you in the midst of the Galactic Civil War between the Rebel Alliance and the Galactic Empire. Two separate games draw you into the Star Wars universe with Imperial Assault, each offering a unique experience. 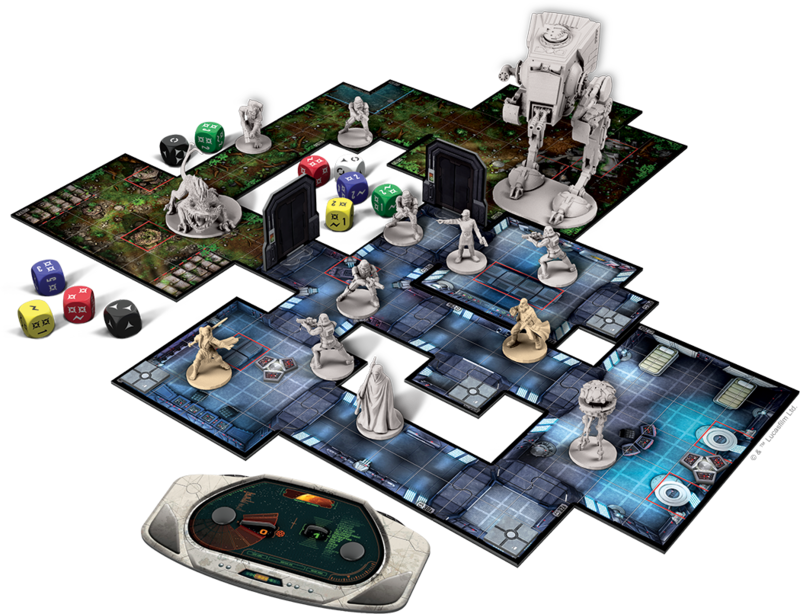 The Imperial Assault campaign game invites you to play through a cinematic tale set in the Star Wars universe. In a campaign, one player commands the armies of the Galactic Empire, threatening to extinguish the flame of the Rebellion forever. Up to four other players become heroes of the Rebel Alliance, engaging in covert operations to undermine the Empire. The skirmish game offers a separate game experience, inviting you and a friend to engage in missions filled with head-to-head, tactical combat. You’ll gather your own strike team and build a deck of Command cards to gain unexpected advantages in the heat of battle, even as you battle to outmaneuver your opponent's forces. 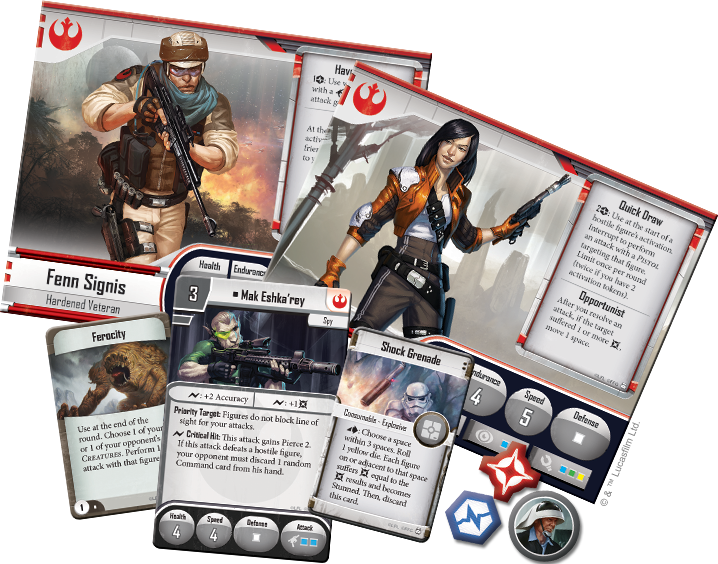 In an Imperial Assault campaign, you can take on the roles of a hero of the Rebellion. Opposing the Rebel heroes, a single player commands the forces of the Empire, including stormtroopers, massive AT-ST walkers, and terrifying villains like Darth Vader. Over the course of the campaign, both the Imperial player and the Rebel heroes gain new experience and skills. As you move forward through the campaign, your options for future missions change based on the outcomes of completed missions, ensuring that you’ll never play the same campaign twice. You may be forced to take unexpected side missions when your ship is impounded, or if you’re captured during a raid on an Imperial base. No matter what the mission is, the Rebel heroes must take care not to become distracted. The resources of the Galactic Empire are truly limitless, and every round the heroes delay increases the Imperial player’s chances to summon reinforcements. Imperial Assault also offers a skirmish game that invites you and one other player to engage in fast-paced, head-to-head battles. While playing a skirmish mission, you and your opponent muster your own striketeam of soldiers, building forces of Imperial, Mercenary, or Rebel units. Command cards can also be played during a mission to give your warriors unexpected bonuses. Once the skirmish mission begins, you clash with your opponent in a battle of tactical skill and cinematic combat. Each skirmish map offers two separate missions that you and your opponent can engage in. You must fight to outmaneuver your opponent, achieving victory through a combination of completing objectives and defeating enemy forces. Whether you’re competing to steal a valuable T-16 Skyhopper, recovering a rare holocron, or focusing on another skirmish mission, the skirmish game offers tense, tactical battles in the Star Wars universe. 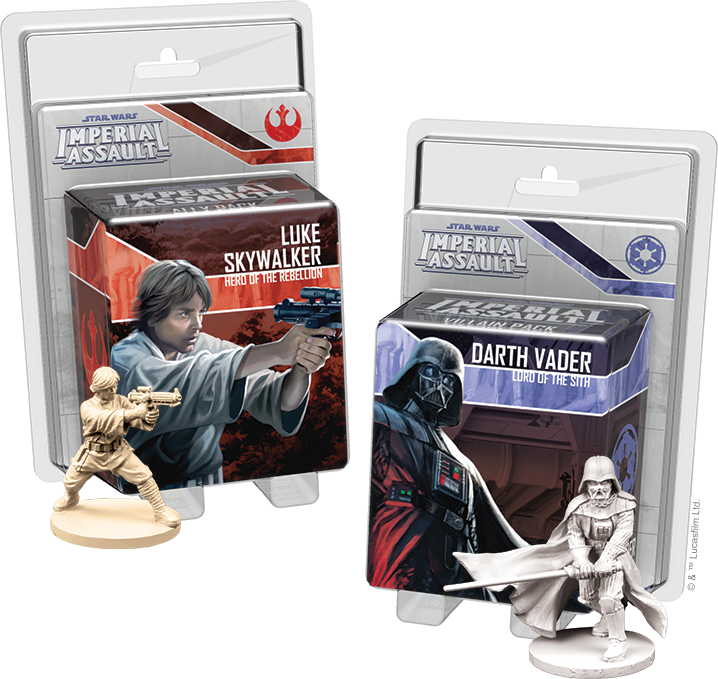 As a bonus, the Imperial Assault Core Set includes both the Luke Skywalker Ally Pack and the Darth Vader Villain Pack. Both of these packs include a sculpted plastic figure to replace the token found in the Imperial Assault Core Set. In addition to the detailed plastic figure, each figure pack includes two skirmish missions using the same map and a campaign side mission highlighting the character included in the pack. You may gather new recruits for the Rebel Alliance or hunt down Luke Skywalker with the missions included in these figure packs. Additional Ally Packs and Villain Packs will be the first expansions to be released for Imperial Assault, bringing added life to the iconic heroes and villains you fight alongside. Each figure pack includes a sculpted plastic figure, alongside a new campaign side mission, two new skirmish missions, and plenty of Command cards, Deployment cards, Reward cards, and Agenda cards to enhance every game! Grab your blaster and ignite your Lightsaber. Begin your assault today!